She thought of the girls in her year: drinking, smoking, eating junk as if none of it mattered, simply because they were young. They all assumed that bad things only ever happen to other people – old people. In five days she will come. It’s Halloween at Piper’s Hall for Young Ladies and Bobbie’s sat round listening to bad ghost stories. One of which is that of a girl who supposedly committed suicide at their school and has become the legend of Bloody Mary. Of course, none of them believe it’s real, but it’s Halloween so they decide to gather round the mirror in candlelit and say her name. 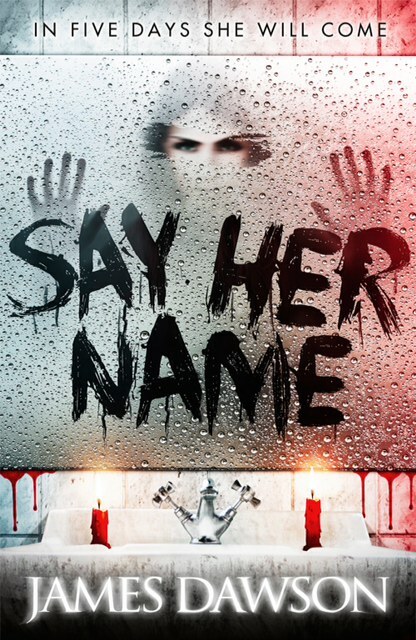 Make sure you don’t need the bathroom when you start reading Say Her Name. There’s some seriously creepy moments all interspersed with nuggets of wisdom and wit from the newly crowned Queen of Teen. The story still manages to touch on a number of real world issues without them being the focus. It’s interesting to see a horror story with some compassion for the ghost, whether or not they’re doing evil things, they are supposed to be troubled spirits. Maybe they had a tough time in life. I liked that Bobbie investigates who Mary was and the events that trapped her in the mirrors. As always. James’ characters feel like real people, the kind that you went to school with (or are at school with now). They’re easy to relate to even if they are at a private school. They’re all imperfect, even those who might like to project otherwise. Bobbie had always subscribed to the idea that teachers went to sleep in Tupperware boxes in their store cupboards. The ending, from the main characters’ point at least, all felt a little too easy. After Cruel Summer, which is brilliant, I suppose I was expecting something else. That’s my only fault of this otherwise entertaining and unsettling read. See how that spooky cover was designed here. This looks amazing. In a completely disturbing, I'll-never-sleep-again kind of way, obviously :) You've also reminded me that I still need to read Cruel Summer so that's two book acquisitions you will be utterly responsible for! They sound a little bit like the Point Horror books I used to love when I was a teenager and that is one nostalgic experience I am definitely up for.